Long before the words ‘I do’ can be formally uttered, there is much preparation. The etching of these beautiful moments on the canvas of time need not be a typical exercise. Rather, the black and white tones of the modern wedding can be complemented with by-gone traditions, to add that extra sparkle to that beautiful day. 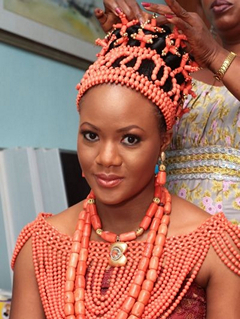 But there is no one single African wedding tradition which could encompass such a diverse continent. From the aesthetics of clothing and hair style to lavish feasts and symbolic rituals, Africa holds a melee of historic customs that can make a wedding truly unforgettable. 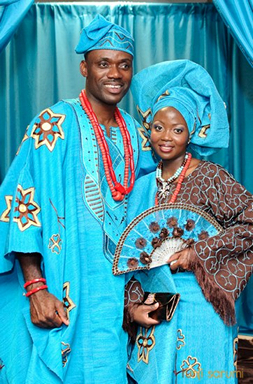 The first image of an African wedding is typically one of the traditional attire. Africans are famous for their brightly coloured fabrics embellished by psychedelic prints and embroidery. Brides’ dresses are elaborate and their designs can incorporate up to five pieces, including a shawl (iborum), blouse (bou-bou), wrap skirt (iro), head wrap (gele) and the traditional veil (tulle). Cowry shells, an ancient form of money, may also be woven into the dress for good luck. 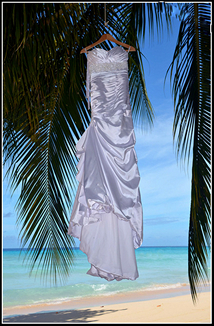 Multiple outfits may be planned since at some weddings, the bride is expected to change attire more than three times on the day of the wedding, to demonstrate her beauty to her in-laws. The choice of colour of attire for both the bride and groom is a deliberate exercise as each tone may be representational of a specific religious belief or custom. Significance is attributed to the colour blue as a sign of peace, purple as the colour of royalty, red for the blood that was shed, gold for prosperity and green and brown for the earth. It is not unusual for both the bride and the groom to wear the same or similar shades of the chosen colours. White is symbolic of purity for both Christian and Muslim Africans and many couples infuse traditional white gowns and tuxedos with accents of Kente cloth or Nwentoma which is a type of silk and cotton fabric made of interwoven cloth strip. 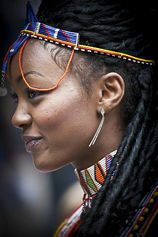 Hairstyles are also important and all across Africa, examples can be found of the elaborate braids worn by both men and women on their wedding day. Amongst the Zulu nation of Southern Africa, the bride changes her clothes many times through-out the duration of the wedding festivities. She wears different traditional outfits with distinctive prized beadwork which portray inspiring messages about love, passion and fidelity. The beautiful elements of an African wedding are known to follow a detailed script of activities running over several days, debunking the notion that a wedding ceremony must take place within a single 24-hour period. Usually this chain of events is designed to ensure that as many friends and relatives as possible, can participate in the symbolic marriage rituals. The Swahili of Kenya in East African have week-long celebrations with separate activities for men and women. In Kenya’s Lamu Island, for example, traditional wedding celebrations still take place over four days, starting with elaborate beauty treatments for the bride such as a coconut oil & sandalwood perfume massages and extensive henna and piko decorations for her hands, arms and feet. The designs are all chosen to symbolise blessings and good luck. Traditionally, the bride does not have to work after the wedding until these have faded. On the second day, the men and women have separate parties (a similar idea to the Western bachelor / hen party). On the third day, the women of the bride’s family make a procession in which they dance Chakacha (belly dance) and sing. At the end they present male toiletries to the groom and jasmine flowers to his family. On this day, the men perform a traditional dance called Kirumbizi. This is followed by the actual wedding ceremony with the exchanging of vows and acceptance of gifts. Of particular note is the kupamba, an elaborate party held the day after the wedding where the Swahili bride is paraded before all gathered. Thereafter the bride is met by her husband, both wearing black robes, which are removed to reveal their most splendid attire and hairstyles. In other parts of Kenya, this ceremony can border on a best-dressed competition among the attendees. 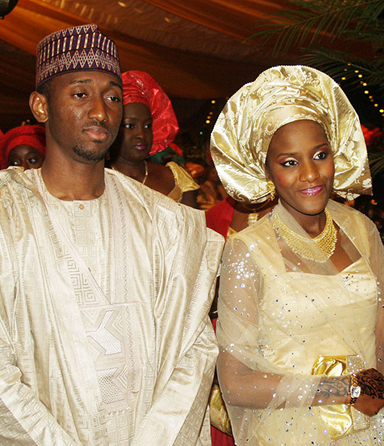 In West Africa, modern Nigerians often have two weddings; a traditional ceremony followed by another at the church or mosque, depending on their religion. 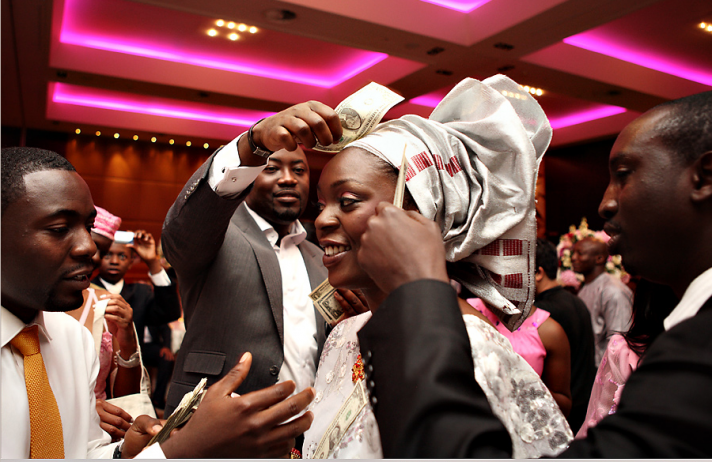 ‘Looking for the groom’ is a traditional wedding game that still takes place at many Nigerian weddings. The groom hides and the bride, carrying a cup of palm wine, has to find him. The wedding guests all participate and extend the fun by telling her ‘he is over there’ while pointing her in the wrong direction. Eventually when she finds the groom, he drinks from her cup and this symbolizes their union. Another unique twist to the Nigerian wedding festivities is often added to the first dance. Couples change from their western bridal attire and return in traditional dress to open the dance floor. All the guests soon join in the dancing while the couple’s friends and family shower the couple with money (instead of wedding gifts). Some couples even hire a ‘dollar man’ whose job is change big notes into smaller ones so all the guests can ‘spray’ the couple throughout the dancing. One happy couple received the equivalent of 75,000 Bds. dollars to start them off on their journey together. Regardless of the region, once the formalities are complete, Africans indulge in much feasting and celebrating. Both families often work together, sometimes days in advance, to prepare the elaborate banquet. Among the staples are jollo rice made with meat stock, tomatoes and shell fish, black-eyed peas, fried plantain, lamb stew, fish or chicken, kola nuts, tea and Palm wine. Traditional and popular music, drumming and of course dancing are a must at weddings across the 52 State Continent. The Moroccan wedding in Northern Africa is a three-tiered gala event that commences with a party for the bride and her closest friends during which the bride purifies herself with a bath of rich milk and black soap. At the next event the bride’s hands are intricately painted in floral and geometric designs to ward off evil spirits. The gala culminates with the wedding where the couple dresses in traditional wear and exchanges rings. The consumption of milk and dates symbolizes the sweetness and fruitfulness of their union. Finally it is important to consider, that even the smaller elements of African wedding rituals add a special touch to this important event. No African wedding ceremony is complete without the recitation of African prayers. Some opt to substitute traditional vows with African love letters, which play heavily on lyricism. One very simple act steeped in tradition includes the South African practice of carrying a Unity Candle once the vows and rings have been exchanged. 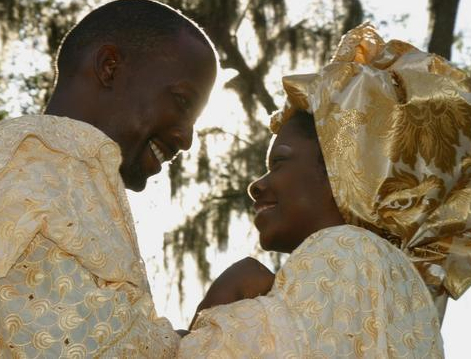 Even the giving of gifts has meaning and significance in many African wedding traditions. 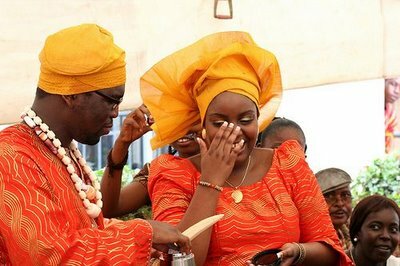 African marriages seem to represent the bringing together of two families and even two communities, rather than the bringing together of two individuals. Especially important is the exchanging of gifts between the families, particularly a dowry of cash or other valuable items on behalf of the groom’s relatives, or blankets and other necessities from the bride’s family. Popular gifts to the couple include bamboo paintings, personalized items (fans, photo frames, seed packets, etc.) miniature brooms and beaded coasters. Among the Woyo people of Central Africa, the bride’s mother gives her a set of carved pot lids when she marries. Each individual lid is carved with images that illustrate a specific proverb concerning marriage and the relationship between men and women. If the husband displeases his wife in any way, she serves him his evening meal in a bowl covered with the appropriate proverb. She can even publicly demonstrate her discontent by serving a meal covered with a proverb lid when he invites friends over for dinner. A perfect gift to ensure future wedded bliss. Perhaps proverb lids should be on every gift list.